Sure, Niagara Falls draws all the tourists, but there are mightier waterfalls that no one visits. They just happen to be underwater. It’s the phenomenon that occurs when dense, cold water comes together with warmer, less-dense water. The Denmark Strait cataract is the largest waterfall on Earth. With water falling 11,500 feet — almost 10 times the height of Niagara — this underwater fall pumps 175 million cubic feet of water per second, almost enough to fill Lake Erie every day. 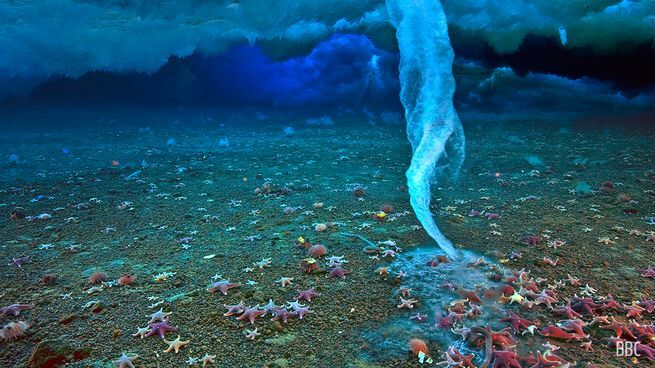 When conditions align perfectly in polar oceans, a deadly underwater icicle can form, slowly making its way to the seafloor until it reaches its destination and traps sea creatures in a chilly tomb. While this is likely the stuff of crustacean nightmares, it’s also the result of the extreme conditions found in these polar waters. When water initially freezes, impurities such as salt are forced out. Eventually, this brine — still in liquid form — seeps back into the water under ice. It quickly descends, freezing the seawater immediately around it until it reaches the floor, possibly claiming lives in the process. 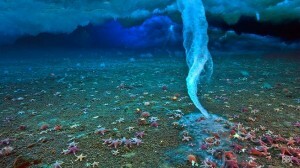 BBC filmmakers captured this phenomenon on film for the documentary series Frozen Planet, and they estimate that the process from brinicle formation to touchdown on the seafloor took five to six hours.